Please refer to our stock # T 1734 when inquiring. A 25mm beautifully carved Ametrine gemstone from far off lands, ~ 25 carats, was caged in sterling silver then added as a dangle. All real, no faux here! Legal: All images design concept content text solely owned by Mimi Dee. 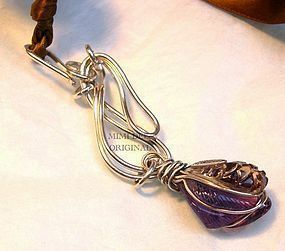 The pendant is hooked on to a knotted toffee color adjustable ribbon to wear as shown or on your own favorite omega, chain or beads. Only one like this! Wt: ~15gram total; 3 3/4". $11 USPS Priority Mial/Ins/Track or free with USA Ck or USPS MO. This signed studio metalwork jewelry artist who also paints oils has made fiber art to wear garments in the past and does not duplicate, has exhibited in various juried art shows, more recently since 1990 to present.